Recipes and techniques developed over five generations — beginning in our great-grandparents’ kitchen. We use all-natural meats with fresh herbs and spices that are ground and blended for each product. Each variety has been taste tested and produced using meticulously researched, authentic recipes. Savino Aquilino Luigi Carrano was born in Villaggio Carrano, a small village in the Piemonte region of Italy, in 1890. He learned to make the traditional sausage of the Piemonte the region from his family. Like many young men from Italy, Savino followed people from his region and immigrated to the United States. When he immigrated to the United States, he left his family behind as well as well as the proper spelling of the family name. In 1906 he came to Michigan to work and sent money “back home” to support la familia. He worked a variety of jobs and was ultimately forced out of work by the Great Depression. 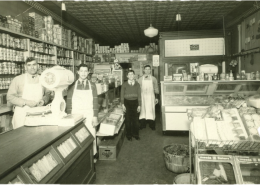 In 1935, Savino and a paesano put their money together and opened the first Piemonte Market on Fenkel Avenue in Detroit, MI. 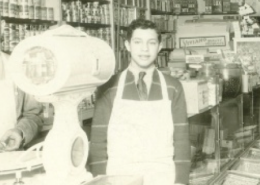 Bernardo Giuseppe Giovanni Carlo (‘Bernie’) Carano, Savino’s son, started working at Piemonte Market in 1935 when he was 15 years old. Bernie learned his artisanal sausage making skills at Piemonte Market. 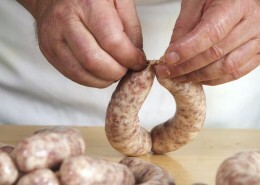 Savino taught his son the traditional family sausage recipes on sausage making day. Made from fresh pork with no fillers or preservatives and a unique blend of spices, the sausage tasted like home to their paesani in Detroit. The market offered many products not found in other stores that were needed for traditional Italian dishes. Ultimately, the popularity of the sausage carried the store, supporting two and then three families when Bernie became a full partner after returning home from his service in the US Navy during World War II. During 1963, Bernie moved Piemonte Market to West Seven Mile Road in Detroit. The sausage again carried the business, appealing to Italian and non-Italian customers. 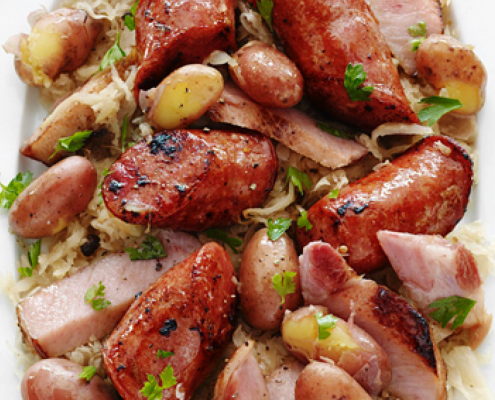 The subtle and unique flavor of the sausage became a favorite tradition on many holiday tables. In 1972, after many successful years, Bernie closed Piemonte Market and retired. At retirement, he passed his family sausage recipes and artisanal sausage making techniques to his children. 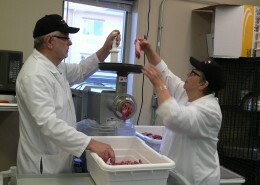 Susan (Carano) Cole and Claude Cole were trained and coached by Bernie to make the Piemonte Market Italian sausage. The uniquely delicious taste of the sausage received enthusiastic responses from family and friends. They encouraged the couple to make the sausage for commercial sales. In 2014, Susan and Claude began producing Piemonte Sausage for wholesale distribution. 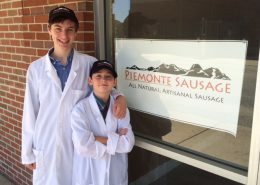 As fourth generation sausage makers, they continue the family tradition. 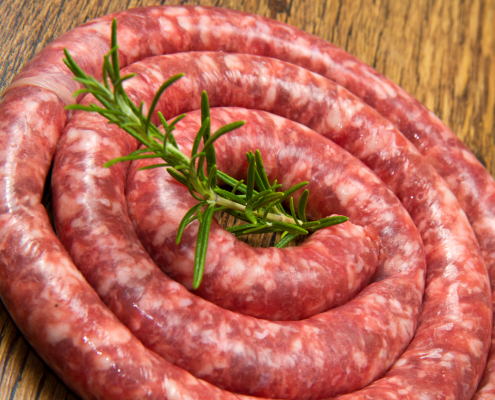 Susan and Claude produce artisanal, gourmet Italian and specialty sausages using only the finest ingredients: freshest spices, natural meats and natural casings with no fillers or preservatives. Piemonte Sausage makers, Susan and Claude are carrying on the fine Carano family tradition of producing distinctive artisanal sausages. Some are based on the family recipes and others are authentic regional or seasonal favorites. Throughout the year, they produce Bernie’s Classic Sweet (Mild), Bernie’s Classic Hot, Bernie’s Classic Fennel and Bernie’s Fennel and Hot. 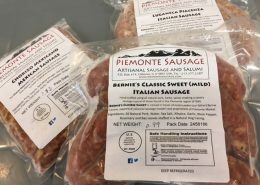 They have expanded their offerings to include other distinctive regional Italian sausages such as Luganeca Piacenza, Colazione, and Cantalupo. Other local favorites include Holiday Apple, Cranberry Pecan and Jalapeno, Tomato Basil Chicken Sausage. 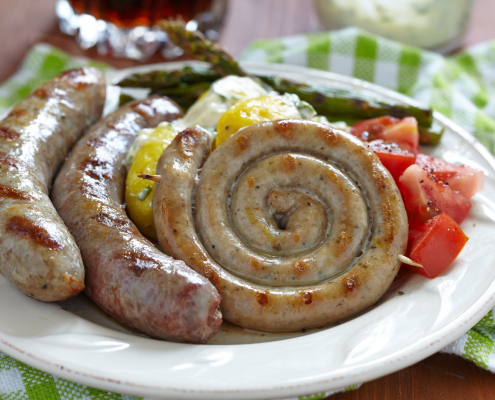 Each sausage variety has its own flavor and its own story. Find out more in the product section of this site. The family sausage making tradition continues onto the sixth generation. Our children and grandchildren are living la storia della familigia Carano and its 100+ year sausage making tradition. As the sixth generation, they continuing the family’s unique sausage making tradition, learning the artisanal techniques and recipes.